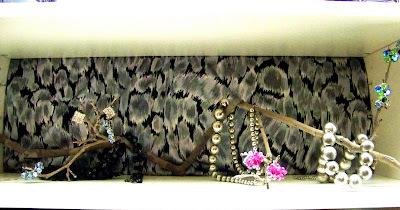 My little jewelry vignette is made with a thrifted blouse stretched over a piece of cardboard for wallpaper. 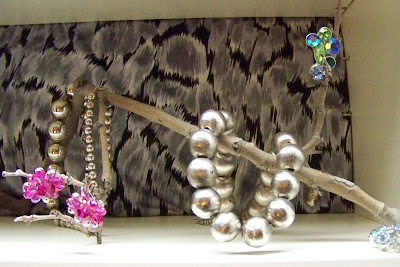 The jewelry tree is, well, a tree - a stick from the park that I did not even bother painting. All the jewelry is courtesy of mom. Anybody else doing the Fall Cure? 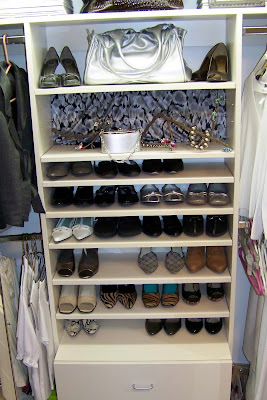 Much more harmonious, and the new shoes to fill the spaces can be your reward. Your jewellery twig is lovely. I didn't realize they are doing a Fall cure. Goodness. Right now I feel like I need a lot of curing, but am trying to go easy on myself and maybe start with fresh energy tomorrow! 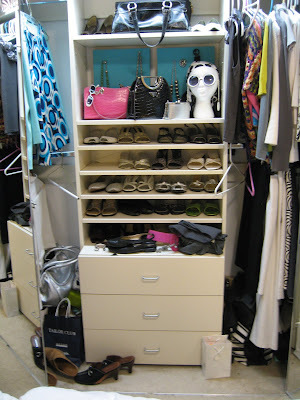 Love your vignette - beautiful and resourceful. Looks great! We just moved and you'd think that'd mean that my closet was in order but alas, it's in a pretty poor state. Between being too rushed to properly clean out my closet before moving and having insufficient shelving for storage, it's a mess!